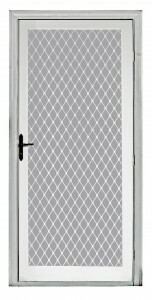 The Atlas swing screen door is an ultra high performance and superior strength swing screen security door. 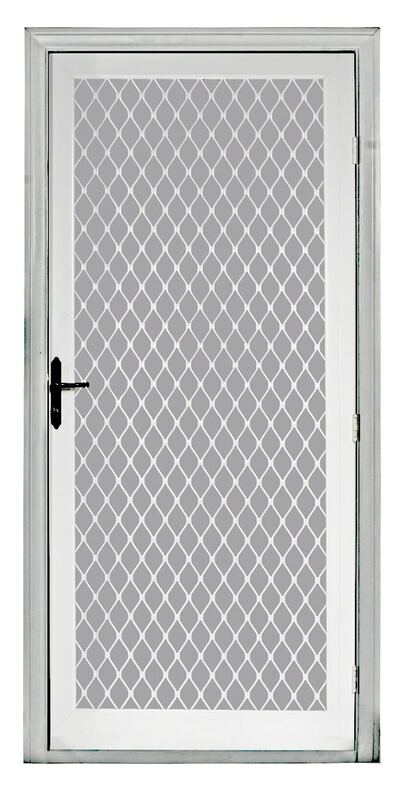 One of the industry’s premier doors featuring an extremely rugged high tensile strength extruded aluminum (3″ x 1″ x .062″ walls) frame combined with heavy duty extruded aluminum spur corner locks utilizing four screws per corner for added strength give the door more durability and stability, which are free from rust assuring years of trouble-free service. The screen is protected by a full extra thick (.297″) Amplimesh grille. Hinges with Oilite bushings are attached to the side adjust expander with heavy duty aircraft quality rivets for smooth opening and long life. The door provides the ultimate in toughness and security with the included extra strong black powder coated brass handle with inside thumb turn and outside key lock. The locking mechanism has a double deadbolt for maximum security. The Atlas includes a bottom expander channel to allow semi-custom adjustments up to 1.5″ high and allow adjustment for door frames that may be out of square. Anodizing: A hard and durable corrosion resistant finish protective surface that enhances the appearance of the extruded aluminum surface. Powder Coated is a much superior surface when compared to “wet paint”, and it is an environmentally friendly process.